Fatigue, sensitivity to heat or cold, unexplained weight loss or weight gain, memory issues, and irritability are just a few of the constellation of unusual symptoms associated with a malfunctioning thyroid. Disproportionately affecting women, who make up 80 percent of all cases, this poorly understood group of disorders can be notoriously difficult to diagnose; many individuals endure symptoms for years before getting the blood work needed to pinpoint the disease. You may have heard the terms hyperthyroidism or hypothyroidism before, but what do these conditions entail? The thyroid itself is a tiny, 2-inch gland located just below the neck, and in front of the larynx. This gland constantly secretes hormones, which are circulated in the bloodstream and throughout the entire body. These hormones are responsible for regulating a wide range of bodily functions, including everything from neural responses and body temperature to the steady beat of your heart. This is part of the reason that thyroid disorders can be so hard to diagnose; taken separately, each symptom could be a sign of any number of unrelated diseases. Because these symptoms can be readily attributed to so many conditions, it can be very easy for doctors to overlook the simple blood test needed to determine thyroid health. To make matters worse, the medical community itself has yet to come to a consensus about what levels of TSH (thyroid stimulating hormone) should raise the red flag. Until fairly recently, doctors generally agreed that levels between 0.5 and 5.0 should be considered normal. However, some endocrinologists began to worry that these results would cast too wide a net, leaving more subtle cases undiagnosed and untreated. Just over a decade ago, the National American Association of Clinical Endocrinologists recommended that physicians narrow the range of acceptable TSH to 0.3 and 3.0. However, many doctors continue to debate the issue, worrying that the new standards would lead to healthy patients getting faulty diagnoses. Stuart M. Weiss, MD, an assistant professor and endocrinologist at New York University, suggests that the best diagnosis will combine blood test results with each patient’s full medical history. In some cases, a clinical exam can reveal a gland that is swollen or otherwise abnormal, and physicians sometimes use an ultrasound exam to identify any such irregularities. However, ultimately your doctor will need to perform a full exam before making an official diagnosis and beginning treatment. 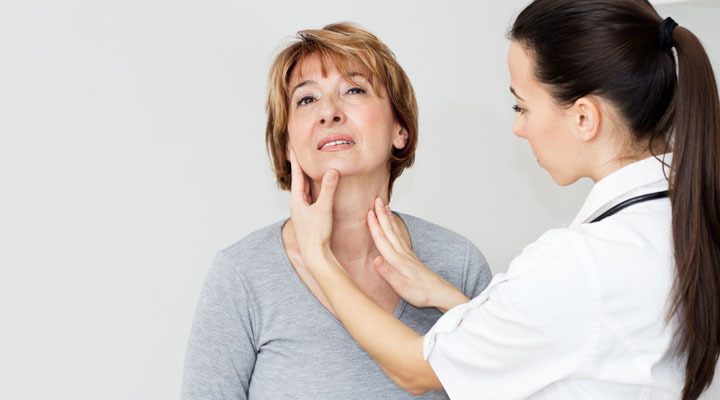 If you suspect that you may be suffering from a thyroid disorder, and particularly if you are a woman approaching menopause, you should feel free to ask your primary care physician to review your symptoms and medical history. Once you have undergone a blood test to determine hormone levels, there are a variety of treatments that can successfully alleviate symptoms.